Let me tell you the story of how I one day discovered Café Régua. I was alone, taking an early morning walk in the empty streets of Saint-Gillis. I was on my way to Bethlehem, looking for nothing in particular. I had been walking for quite some time. Weariness was around the corner. Suddenly, dark clouds congregated above my head. In the blink of an eye, an Old Testamental rain fell down on me. I had to find shelter quickly, but I foresaw trouble in finding a place already open at that unholy hour: 07:34. Then, I saw light coming from Café Régua. I stepped in, soaked. Warmth came my way. Gorete and Chris looked at me from behind their counter. My watch told me it was still 07:34. The ceiling and walls were wooden. Some clients were having breakfast. One was reading a newspaper. Four men were playing cards. They were before-working. I sat down at a table in the back and ordered a coffee, dripping. Some clients stared at me. Carefully, I said ‘Hello’. Behind them, a climbing plant was slowly growing towards the wall clock. It indicated 07:40. Next to the counter, a bird chirped three times. 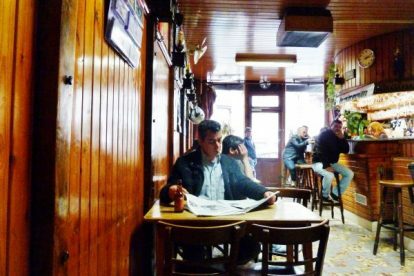 Although that particular morning might have taken on Biblical dimensions in my mind, I often come back to this small Portuguese café since that day. For a coffee or a beer, to read or chat. I adore the simplicity and calm. Things plain and simple stir the imagination. Especially when it rains.